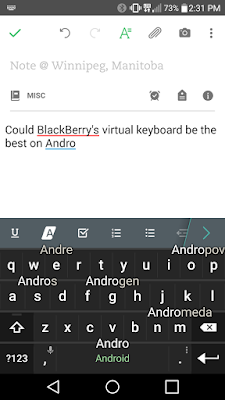 apk App Blackberry Keyboard Review typing BlackBerry’s Virtual Keyboard; The Best on Android? 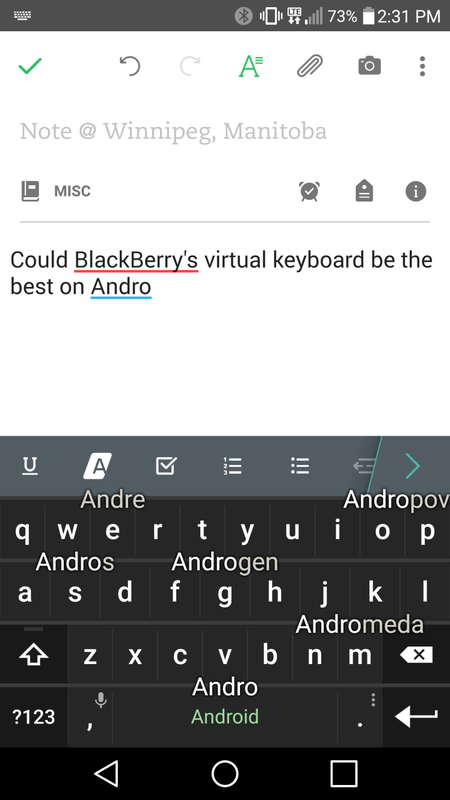 BlackBerry’s Virtual Keyboard; The Best on Android? When the BlackBerry PRIV was released, and the BlackBerry Keyboard app hit the Google Play Store, it didn’t take long for the community on XDA to pull the APK and make it public. I couldn’t resist to try this keyboard out for myself. I’d heard very good things from users of BlackBerry smartphones running BB10. I was curious to see how it would fair out on my LG G4. I’ve been bouncing around over the years between SwiftKey, Google Keyboard, and Fleksy. I have tried nearly all the major keyboards on Android as well, such as Minuum, TouchPal, Swype, and others. I can honestly say, I have not been able to type as fast and obtain accurate results as I have using BlackBerry’s keyboard on my smartphone. When tapping a text field, the BlackBerry keyboard is brought up almost instantaneously for me. I would say it shows up as fast as the Google Keyboard, and faster than SwiftKey. When I type, I see no lag whatsoever. The prediction of this keyboard is top notch. As you can see from my screenshot above, the words are carefully placed on the keyboard, lining themselves up with the next letter you may press. It’s very clever. This, I will admit, I feel will take getting used to. I find myself pausing my groove to see what’s there. Now, with that said, I also noted I’ve relied on these predictions even less than any other keyboard for one main reason alone. The most predicted word is right there on the space bar. With every single one of these (Fleksy, Google Keyboard, Swype, SwiftKey, TouchPal, and Minuum) the predictions are up top. Well why do they keep them so far away from the space bar? Why not put them below the space bar, or on it? The creators of the BlackBerry virtual keyboard must have asked the same question, and boom, there you have it. Now, with my own “sloppy” typing, I can hammer out words very quickly with greater ease too, and everytime I tap the spacebar, even if my some keys were missed, the predicted word shows up in place and I can keep on going. I am unsure if BlackBerry is overly fond of their APK being out and about for all of us to download. But, for what it is worth, it a brilliant keyboard, my new favourite, and I am inclined to recommend anything with an Android device.